There’s nothing nicer on a cold winter day than snuggling up with a good book. 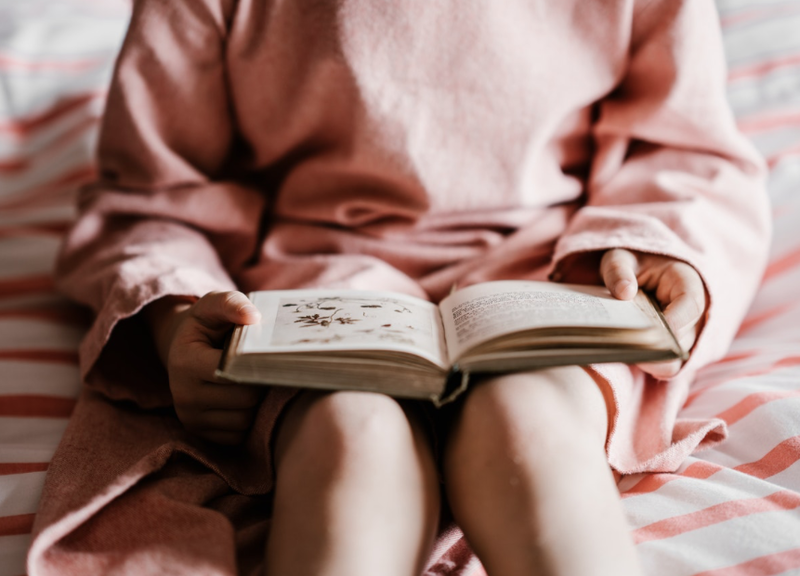 In addition to creating a peaceful rest and a healthy reprieve from screen time, reading (out loud or silently) benefits children’s language and literacy skills and expands their world. Whether your kids are already big readers or struggle to embrace the habit, these quick tips will help make reading much more fun and less like a chore. Good readers learn those habits at home. If you take the time to read on your own or out loud to them, they will model your example. Bedtime reading can often be an easy way to settle down from the day and invite a peaceful sleep. If your little ones are often reluctant to get ready for bed, consider setting a designated time, and make a deal that if they are in bed by that time—pjs on, teeth brushed, etc.—they can read (or be read to) for 30 minutes. Not only will this help with bedtime angst, but it also sets reading up as a reward rather than a chore. A designated reading spot doesn’t need to be elaborate. Kids can claim a corner of the couch or a quiet spot in their room with a blanket, or keep things mobile with a reading pillow. The important elements to keep in mind are good lighting and as much peace and quiet as possible. The consistency will make it easier for them to get right to it, without so many excuses or distractions to keep their little minds wandering. Nothing excites young readers like a visit to the library and a fresh stack of books to take home. Adding a weekly trip to your schedule will yield great results in igniting their passion for reading as well as increasing literary competency. When searching through the aisles of books, be sure to let your child choose on their own. They may need you to help steer them to the appropriate age range for their reading level. And don’t forget to make use of the librarians—they’re there to help, and often have wonderful suggestions based on your child’s particular interests. The library is also a great, often FREE resource for keeping your kids entertained with book-related events and activities. Most locations of the Indianapolis Public Library have story times for kids in all age ranges, as well as fun family activities and workshops. While you’re perusing the library stacks, see if you can find a good family-friendly series. The little ones will enjoy being read to, and you may be surprised at how much the older children get into it, too. If you have some advanced readers in the house, take turns reading chapters. Shared story time encourages family bonding and provides subjects for discussion later on. “Again! Again! Again!” When you’ve hit on a good book, your little listeners may ask you to read it repeatedly. This is a great way for them to learn about words and letters. Allowing them to help you read along gives them confidence and makes things fun. Usually, about the time you feel like you just can’t read it one more time, they’ll move on to a new favorite. The happy habit of reading doesn’t need to be confined to the house. If you have a book handy, you can make the most out of car trips, bus rides, waiting in lines, and stolen moments throughout the day. Some kids become so engrossed in a book they even have to be reminded to do things like eat dinner of get ready for school in the morning! You can ease transitions by setting a timer or by giving a 2 minute warning when it’s time to move on to something else. When you practice good reading habits at home, both you and your kids reap the rewards. The benefits are endless, creating confidence, compassion, competency, and so much more just by opening the pages and discovering the world of books.